Last winter I shared with you a recipe for popcorn with dark chocolate, almonds, and ras el hanout--a North African spice blend that is one of my firm favorites. In that post, I actually talked about how I fell in love with it when I used it on some roasted carrots in place of the cumin that had run out earlier that day. 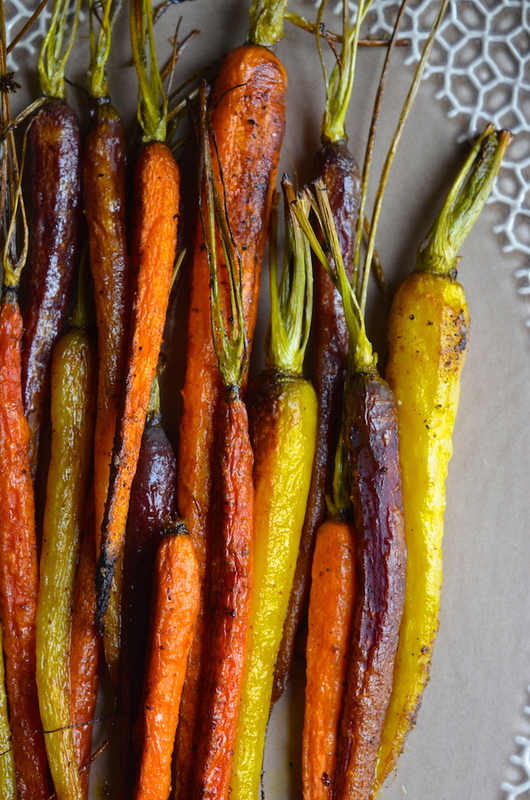 It took me a full year to realize that while I may have mentioned that recipe for the Roasted Carrots with Ras el Hanout...I never actually shared it with you! What a tease! Am correcting this today, and I urge you to give it a try as soon as possible. Ras el hanout is a somewhat sweet and savory spice mix that's absolutely wonderful with roasted vegetables. For this dish, I roughly peel the carrots (I used gorgeous multi-colored rainbow carrots, but any kind will do! ), then rub them with olive oil, salt, and the spice. I also add a bit of cayenne because I love heat, though you can skip it if you don't. Into a very hot oven they go for about 20-25 minutes, depending on how fat your carrots are (mine weren't very fat at all). Give them a toss about halfway through--you want to get the char marks on all sides, and then pull them out when they start to look just a tiny bit wrinkled. I serve them all jumbled on a platter with a side of whipped Greek yogurt sprinkled with sumac or sesame seeds or whatever else is on hand. If you have some fresh mint, a few leaves torn on top would be lovely. Serve this as a side with a lovely roasted main, and you'll have a wonderful winter meal. Shopping tip: Ras el Hanout is pretty commonly found at well-stocked supermarkets like Whole Foods, online, or at spice shops. Note that the mixes can vary based on the spice combination, so shop around and find the one you like best. Personally I go for the ones that are a little sweeter without too much cumin or turmeric (so look for something brown--not yellow). If you can't find it, Indian Garam Masala OR Chinese Five Spice would also work well in this recipe (each with slightly different, but similar, flavor profiles.) Buy Ras el Hanout online here. Peel the carrots and arrange on a large metal baking sheet. Drizzle generously with olive oil, then sprinkle with ras el hanout, cayenne, and salt. Toss carrots to coat evenly. 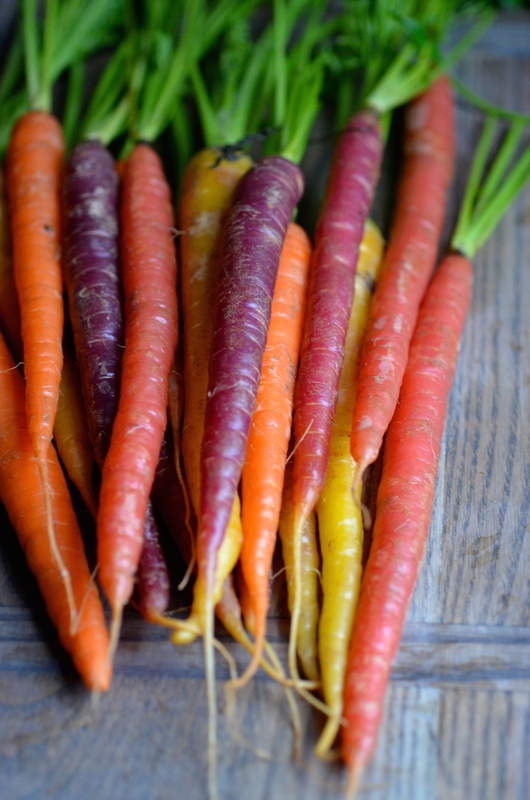 Roast 15 minutes, toss once, then roast another 10 minutes, or until carrots are slightly charred and wrinkled. Place on a serving platter and sprinkle with flaky sea salt. 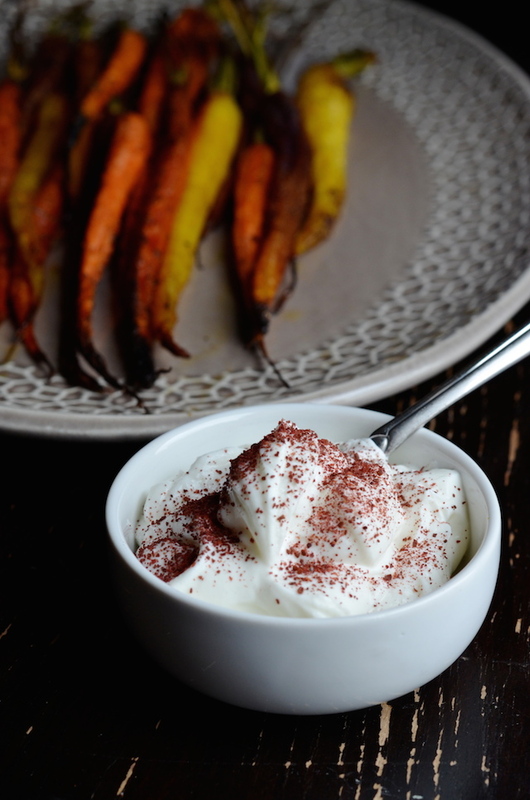 Serve with Greek yogurt on the side for dipping.